I cannot say why, exactly, I was so taken by this blouse when I saw it in September, but taken I was. Fortunately, even my taken-self is capable of patience and so we waited for the post holiday — and I don’t mean Columbus Day — sales. Because as charming as this blouse is, it’s a little odd and therefore not an appropriate vessel for investment-type spending. Oh really? You wouldn’t like me when I’m angry. 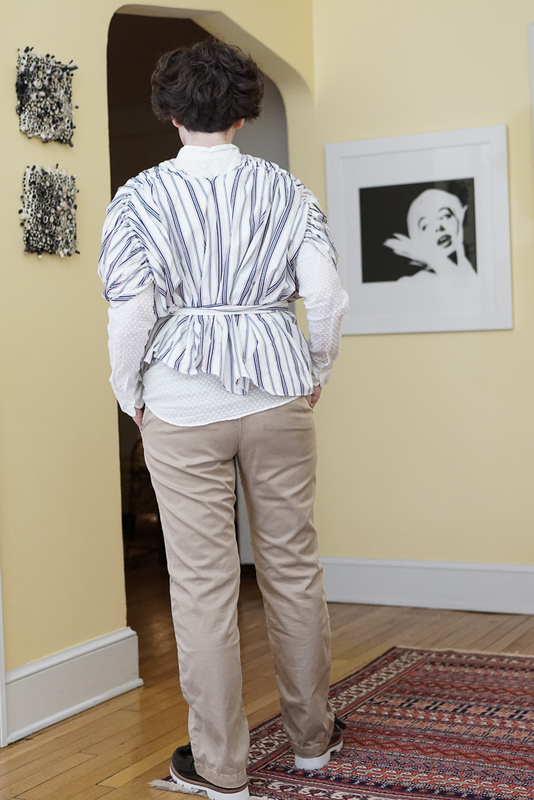 The blouse could be worn alone, but I am distrustful of wrap-style garments and paranoid about the possibility of bare midriff — so I layered it over another blouse that provides ample coverage for any type of slip or fall. 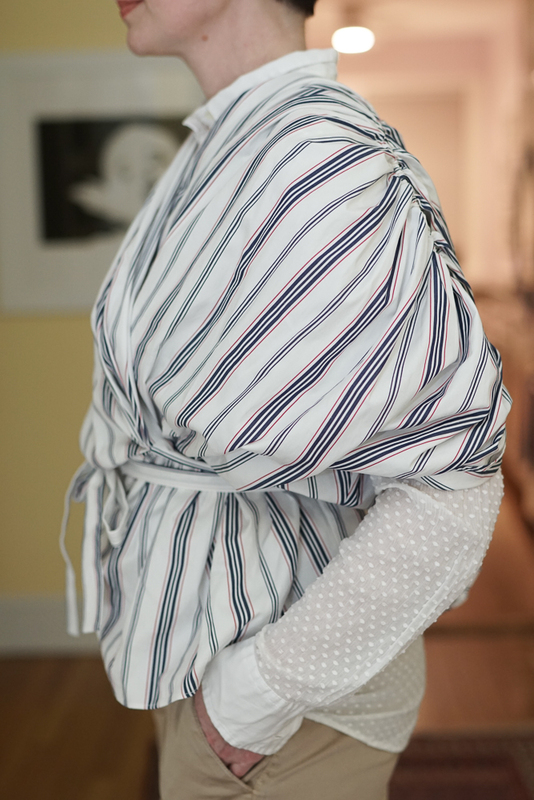 In addition to this striped poplin — so business — this blouse also came in a red chiffon (very nice drape) and a navy wool challis (also very nice drape), but those were sold out. 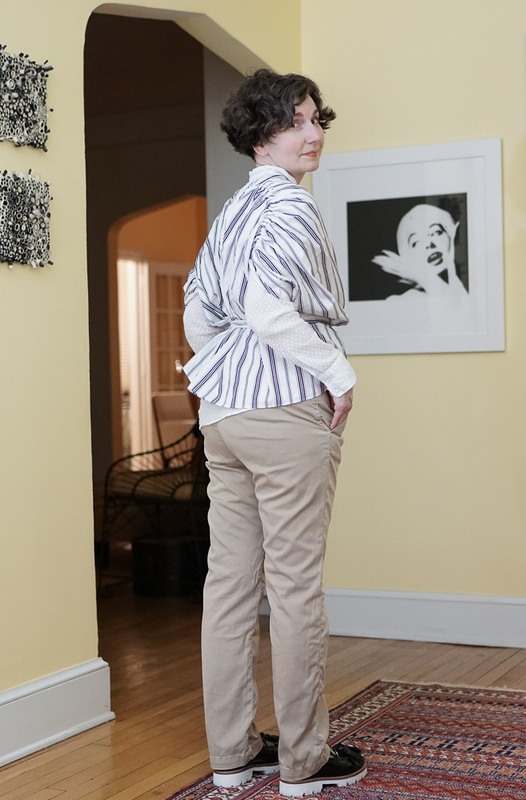 The striped poplin is just right for Casual Friday with khakis or Low Business Casual if paired with pinstriped pants and flats. Bad side: Is it better or worse with head partially cropped? What’s that? You want to see my awesome shoes? Sure! Come closer! It’s my nature, she cried. Also, new lipstick alert. I’ve been wanting something pale, so I rooted through my lip pencils found a light NARS Satin Lip Pencil (Isola Bella) which I tried with a new NARS Lip Gloss (Supervixen, I am embarrassed to say). I like the combination and it keeps me from biting my lips. I… this one… I just can’t see wearing this to work. Or out of the house. I think maybe I need to see the pinstripe outfit you describe? Usually I think your challenging pieces are challenging but successful on you. 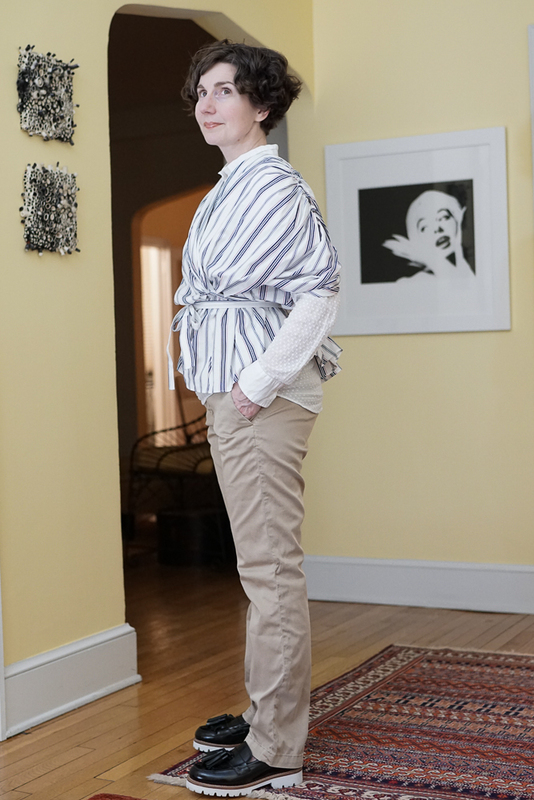 This one… There is so much volume in the blouse that it eats your shape, even with the belt – and I keep thinking it’s your bathrobe? Maybe Fatima can help? On further thought, and looking at the webpage and styling, I can see the idea, so I take back the “I can’t see wearing this”. I really do think this may be just a question of tweaking the fit slightly? 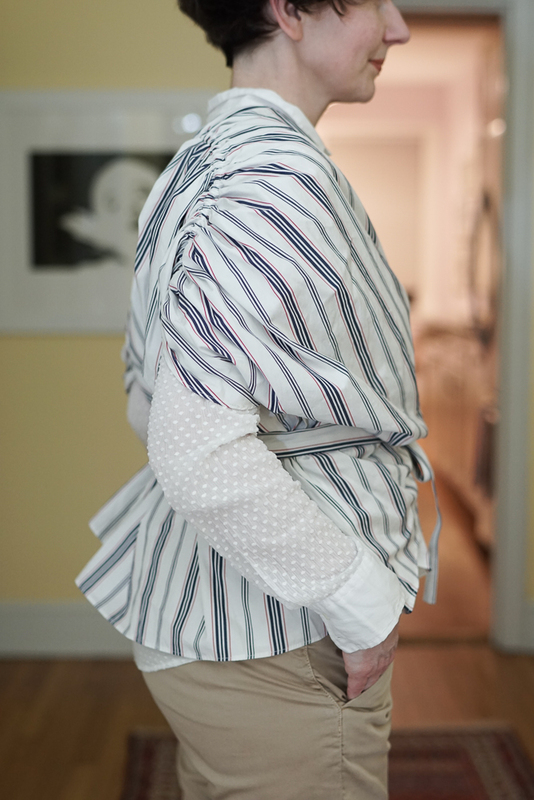 Or moving the shoulder seams forward slightly from where they’re resting behind your collar bone? You are not a prude… you are modest – which I totally appreciate! 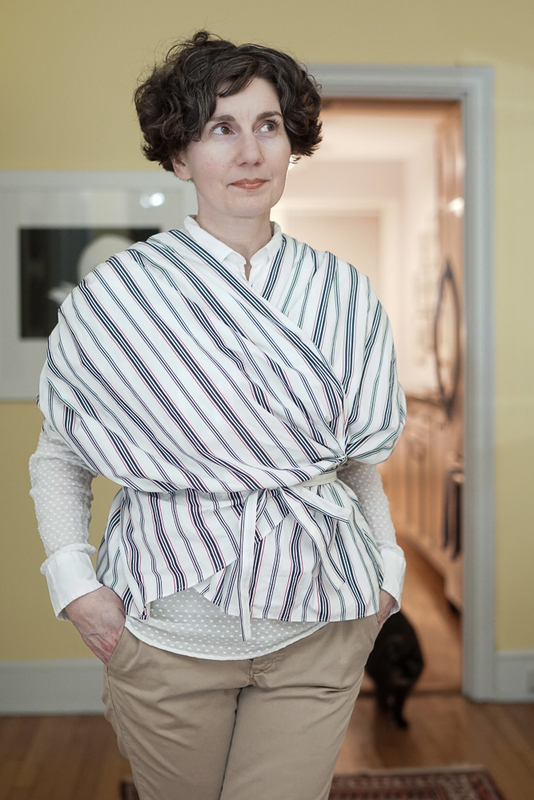 This COULD also be a very clever way for discreet breast feeding… or carrying one of your cats… lots of uses. I’m not sure I could carry it off for work either. Have you tried this over a dress? With the collared shirt underneath it feels like you are wearing A Lot of Clothes. I could see this blouse over a long (mid-calf), straight jersey dress. Is that what you were thinking? 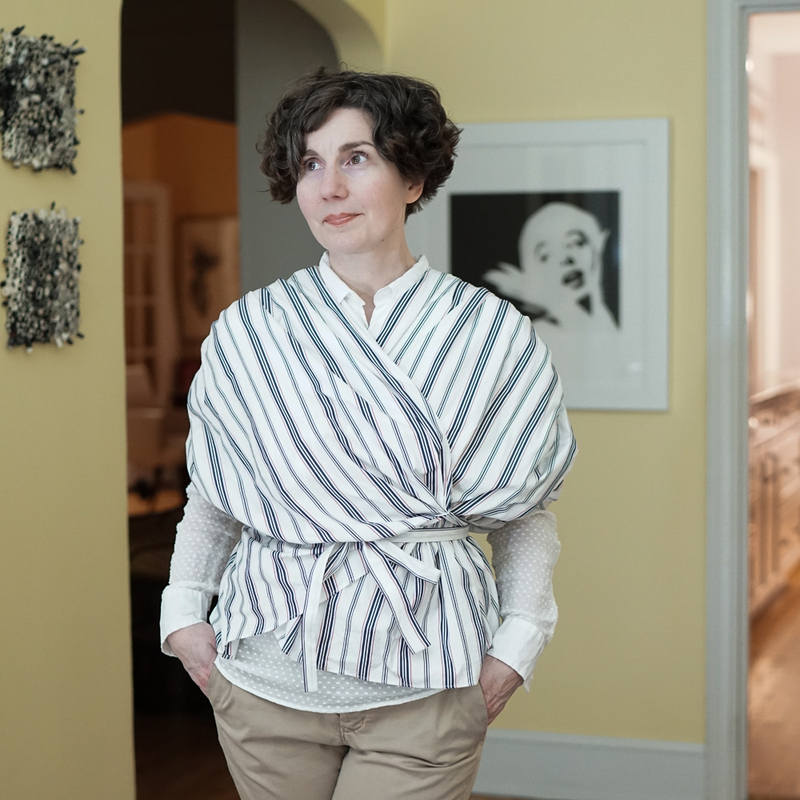 When I bought this blouse, I thought I would wear it with a grey wool suit — under the jacket — and realized when it arrived that that was simply not in the realm of possibility. It would be like wearing a life-jacket under a suit . . . which as I am saying it (in my head) does sound sort of cool . . .
You rock it, Directrice. Why the hell not??? Today I wore a dark teal blue blouse and forest green tights. They went together more strangely than you might even be imagining. I acknowledged the fact as I surveyed the effect, and wore them anyway. No one is harmed by these sartorial leaps of judgment. We bring only joy. Too right, Gisele! It’s only going to work. For what do we live, but to make sport for our neighbors, and laugh at them in our turn? It is my most frequent touchstone. Guidance for every situation! This is indeed an eccentric blouse but what a good outfit on you ! 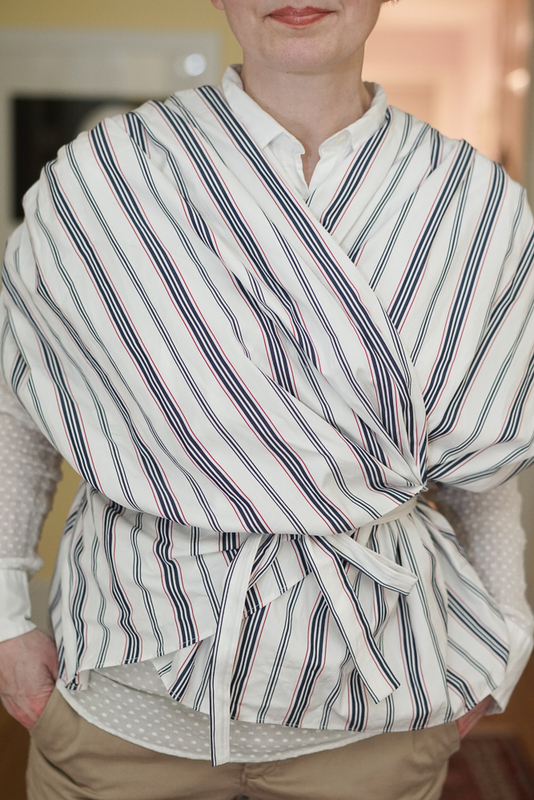 Nice and crisp (some of us would emerge in a rumpled mess if wearing this under a winter coat) and certainly nothing to spook any fashion-inattentive co-workers – striped poplin, khakis, sensible shoes, check, check and check. MC Bontemps — I commend you on raising a problem that I had not even started to consider. What will I do when the soles get dirty. Do you think I could clean them with some bleach diluted with water and a scrub brush? How likely is it that I would get bleach on my clothes or in my eye? I am going to poke around the internet and see what advice I can find. Will report back in the future! I both agree with your husband and kind of love this. I’m curious how garments like this retain their structure after cleaning. How on earth does one iron such a top? Does it unwrap all the way? There’ something about it, right? I can’t explain it. It does unwrap completely and could probably serve as the bottom sheet on a twin bed. Versatile! I am not sure how it will be laundered/ironed and therefore am thinking that I will take it to the cleaner and let them sort it out — but because it is just a plain cotton poplin, I won’t ruin it if I wash it at home. Stay tuned, Cat! That’s interesting. Of course, I’d wear it with a plain skirt and a tank that didn’t show, except in the case of a malfunction. I’d add that wearing things like that with something knit and absorption underneath can lengthen their wear between ironings time. I’d be interested to see how it’s put together beyond the self belt. Are there buttons holding the wrap together? the photo on the site makes the back look like it’s got a little cape. Did they just not catch the back of the blouse in the belt? Good observation and yes, Ginger! 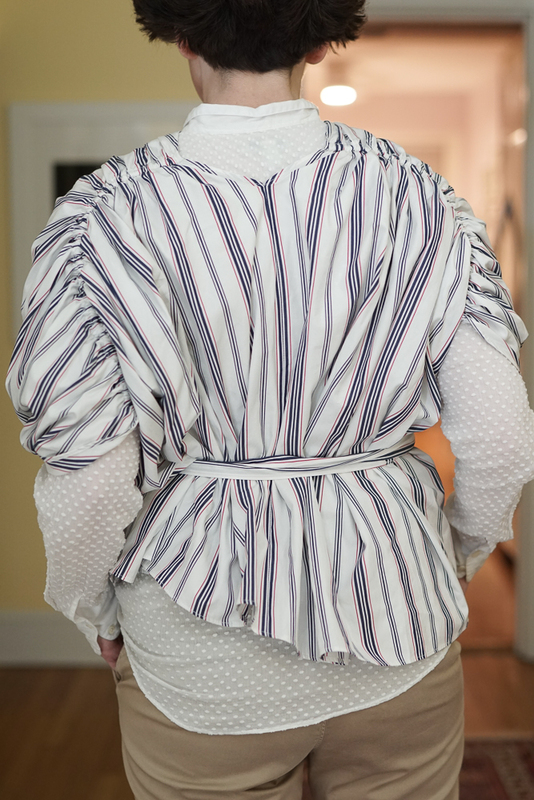 The photos of this blouse (striped poplin) and the other fabrics (chiffon, challis) show the blouse worn in several different postures — with the shoulder seams over the collarbone, with the shoulder seams pulled back (as I have), with the back cinched by the self-belt and not. There’s a lot of fabric to work with. Your photographer liked my cargo pants today at the Sister District summit since they are great for cell phones, but sadly they’re just Target mossimo! Love the blog! Lori of Lori’s Shoes in Chicago (best shoe store ever) recommends Softscrub for cleaning white soles fyi. And I love the blouse on you. 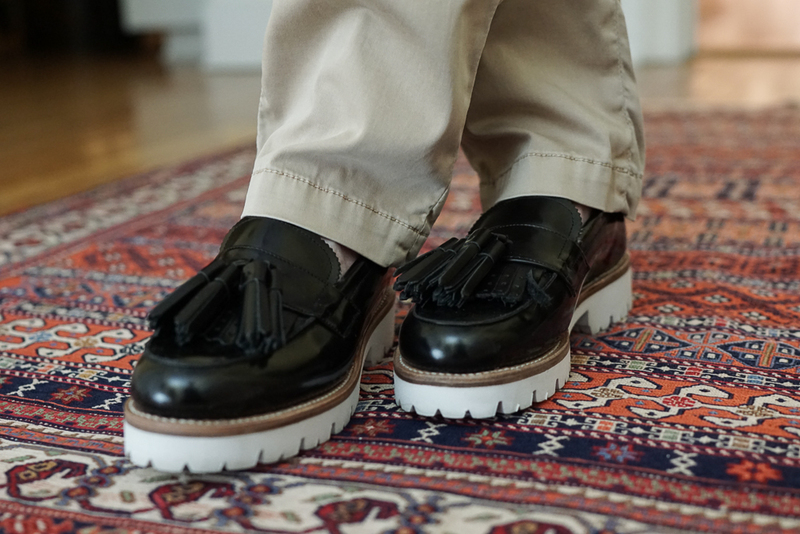 Thank you, Janet — for the advice and the recommendation of Lori’s Shoes! For cleaning the white soles of my shoes I simply use an old toothbrush and some liquid soap or dishwashing liquid. Some people suggest a dirt eraser sponge. 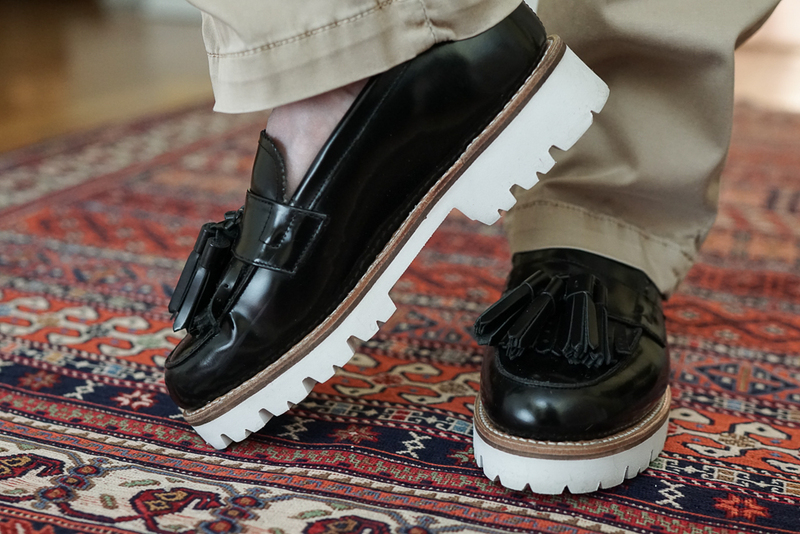 I am so delighted that readers have been moved to comment by The White Sole Challenge. Thank you, Jan — so helpful.